> at 9:45 i get a phone call from my friend to go see some random movie at 10:05. i was being extremely productive at the time (playing nintendo 64), but i dropped everything i was doing and went to the local Carmike Cinema to find out what this whole thing was all about. upon arrival at the theater, i sort of wished i was going to see Norbit instead for two reasons: 1) it looks ridiculous and 2) the entire basketball team was in line to see it when we got there. i informed Maybank that i approved of his performance against KU. he called me bro in return. holla. this movie turned out to be not only an extremely well spent 8 bucks, but also an extremely interesting and overall great movie. The movie opens up with a narrator telling us all about some curious little girl who was the daughter of the king of the underworld and she wanted to see what the earth’s surface (much like Ariel). so one night the princess eludes the city guards and sneaks out of the underworld and on to the earth’s surface, but upon making it, the sunlight blinds her and she forgets all about her former life underground. eventually she dies, but her father, the king, vows that he will never rest until her spirit somehow, someway, finds its way back to the underworld. after this quick fairy tale reading the movie officially begins. 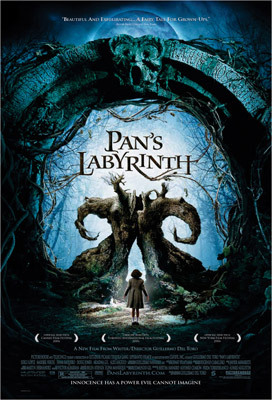 Pan’s Labyrinth takes place in the Spainish woodlands during WWII. the whole movie is in Spanish, so there are subtitles, but it didn’t take away from this movie whatsoever. The movie centers around about a 11 year old girl named Ofilia. She is a brave, adventurous, and emotionally strong young girl who travels with her pregnant mother to stay with her step-father, a Captain of the Spanish army. Also, and more importantly probably, Ofilia loves to read fairy tales and, as a result, has an unbelievable imagination. Upon arriving at her step-father’s military home she explores the surrounding area and discovers a creepy archway leading into a hedge maze. Ofilia’s curiosity eventually fuels her deep into the labyrinth and eventually to a huge spiral staircase way down into the earth (the same staircase the princess of the underworld had apparently used to escape). her fairy tale mind works wonders with her from here and all sorts of awesome creatures show up throughout the movie due to her heightened levels of fantasy. while all of this is going on, there is a constant struggle between the Spanish armies and a group of guerrillas who are supposedly plotting to attack the Captain’s base. The Captain is a ruthless and heartless man and really makes for a graphic movie. some parts are very “Saving-Private-Ryan-Esque-Kinda” he tortures a guy, bashes a guy’s face with a glass bottle for no reason, and you get the sense that he truly only cares about himself. anyways, Ofilia is caught up in all this tension between what is real and what is her imagination and who she can trust and who she can’t. It becomes rather obvious rather quickly that Ofilia is the spirit of the king’s daughter that he is waiting for, and while all of the people she loves and hates continue to tell her that fairy tales are a waste of time, she continues to explore and search deeper into the mystery of the labyrinth. i’m not explaining it too terribly well, i realize that, but what i will say is this – you should probably see this movie. i think it was nominated for like 6 golden globes. it gets your creative mindset really flowing, and, at the same time, it really ups your intensity level. another thing i really liked about this movie is that it is loaded with spiritually significant stuff. lots of really cool Jesus images in this film, so if you go see it – keep an eye out for the parallels. they do abound. anyways. thats that. i was glad i went. i give it a 7.38. >Norbit was ridiculously hilarious. me and rudy saw it last night. too funny. Next Next post: >books and piano.